Yes, that’s right – peanut butter on a burger. These protein-packed Spicy Peanut Butter Burger Sliders offer a unique and tasty flavor profile with just the right balance of savory, sweet and spicy. 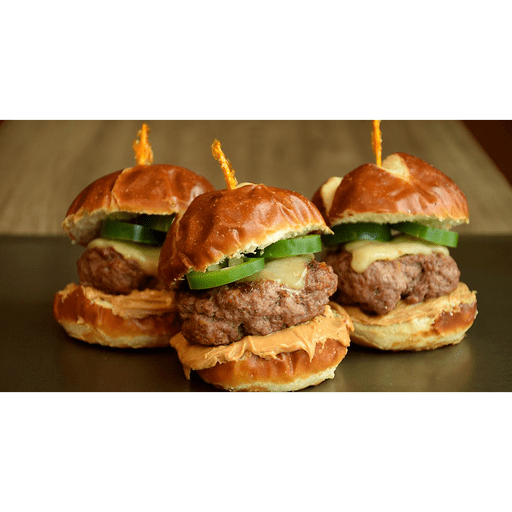 Grill up these sliders to kick it up a notch at your next barbecue! 1. Preheat grill to medium-high heat. Mix together the ground turkey/beef blend, soy sauce, 2 Tbsp. peanut butter and black pepper. Divide the mixture into 12 balls and flatten each ball into the size of a patty the size of the mini buns. 1. Place patties on grill and cook for 4 minutes. Flip the patties over with a spatula and cook until desired doneness is reached. During the last 2 minutes of cooking, place a slice of cheese on top of the patty and close the grill lid. 1. Divide remaining peanut butter among 12 bottom buns, top each with a burger patty, jalapeño slices and red onion. Cover with top bun and serve immediately. For gluten free: Use tamari in place of soy sauce. Use gluten free hot dog buns cut into thirds in place of mini pretzel buns. Calories 330, Total Fat 15g (Saturated 4.5g, Trans 0g), Cholesterol 50mg, Sodium 300mg, Total Carbohydrate 61g (Dietary Fiber 1g, Sugars 2g), Protein 22g, Vitamin A 2%, Vitamin C 6%, Calcium 6%, Iron 8% *Nutritional values are an approximation. Actual nutritional values may vary due to preparation techniques, variations related to suppliers, regional and seasonal differences, or rounding.